Man's best friend is battling one of man’s worst enemies -- obesity. 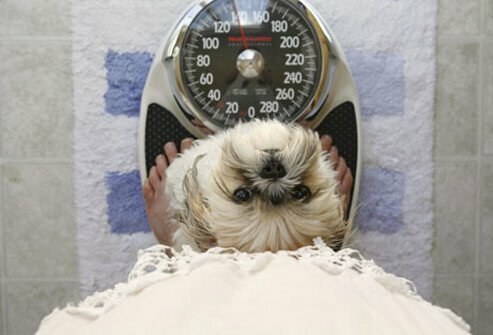 Up to 50% of dogs in the U.S. weigh too much. Like people, overweight dogs are at risk for health problems, from arthritis to heart disease. This is one challenge you and your pet can face together. Research suggests people who exercise with their dogs are more likely to stick to a fitness program. The key is finding activities you both enjoy. Brisk walking is an ideal exercise for human and hound. The benefits include a stronger heart, lower blood pressure, more energy, denser bones, and a lower risk of depression. In dogs, regular walks can also reduce common behavior problems. There’s no set rule for how far or how long a dog should walk. Just work slowly toward a goal and slowly increase your speed and how far you walk. A trip to the vet for your dog and a doctor’s checkup for you is recommended before starting an exercise program. If long walks don't entice you, try dancing with your dog. Also called musical freestyle, you choreograph a dance routine to upbeat music. You'll have your pooch running between your legs and performing other tricks, while both of you get an aerobic workout. The benefits of dance include burning calories and developing greater stamina, better balance, lower blood pressure, and improved muscle tone and bone density. Not all dogs are built to jog. Greyhounds, for example, are pros at short-distance sprinting, but can become fatigued during long-distance runs. 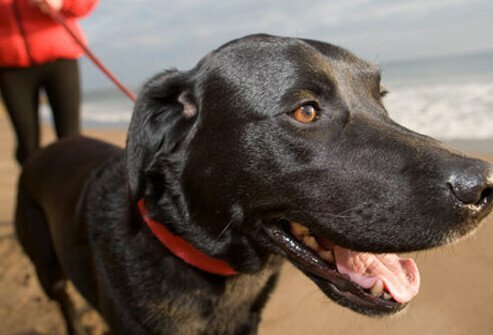 If you want to jog with your dog, choose a breed that is suited to distance-running, such as a Labrador. Wait until your pup is full grown and then gradually build up to a 30-minute excursion. This should include five minutes of warm-up, 20 minutes of jogging, and five minutes of cooldown. Remember that dogs can't sweat, so avoid the hot times of the day and stop if your dog is lagging behind you. 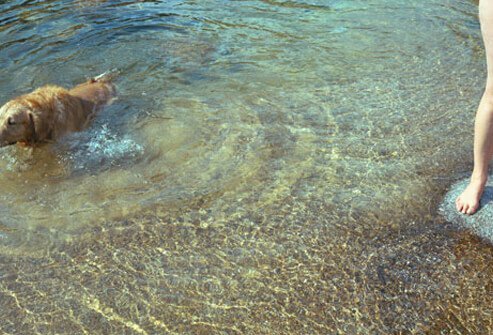 Swimming is an all-in-one workout that is especially beneficial for people or dogs with arthritis. Because it's a low-impact sport, swimming is easy on the joints. But that doesn't mean it's a wimpy workout. Swimming works various muscle groups, improves endurance, and strengthens the heart and lungs. Not all dogs enjoy swimming, so start slowly. Use toys or treats for encouragement, and if your dog still resists, find another sport. 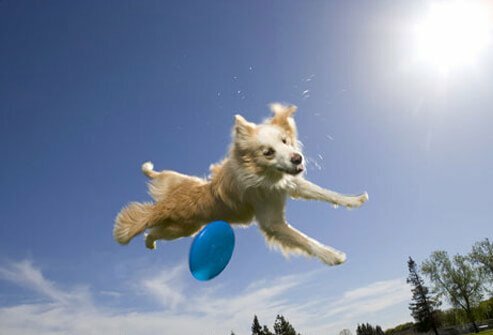 Frisbee offers a classic canine workout. You can play a relaxed game in your own yard or join a formal "Disc Dog" team. Participating in competitions may give you and your dog greater motivation to practice regularly. Competitions give you a goal to work toward. They give you motivation to keep exercising, while working on your training and your relationship with your pet. 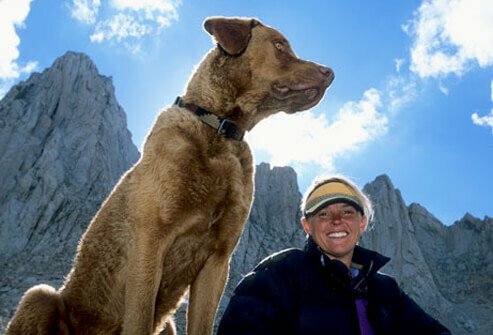 If your area offers hiking opportunities, you’ve got one lucky dog. Most dogs love to go out and find new smells and see other animals while spending time with their owner. Like walking, you’ll need to keep a brisk enough pace to elevate your heart rate. And if you live in an area where ticks carry Lyme disease, make sure you cover up and apply an insect repellent containing DEET -- and protect your dog with flea and tick prevention and a Lyme vaccine. After hiking, check your body for ticks and do the same for your dog. Agility training is another popular goal-oriented sport. 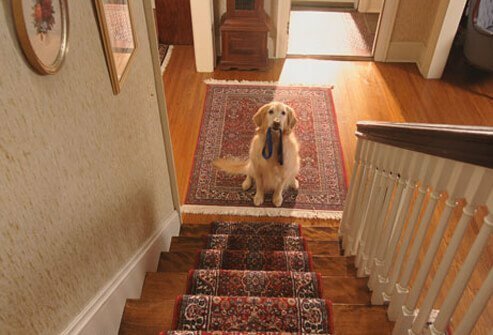 Your dog races through an obstacle course with ladders, hurdles and tunnels, while you run alongside offering praise and encouragement. 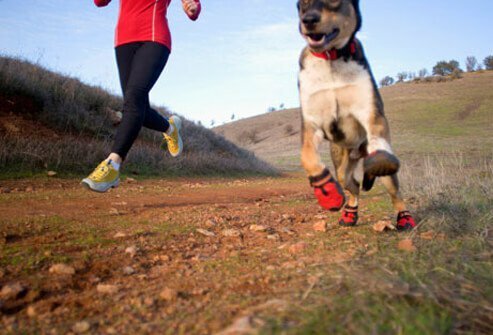 The fast pace provides both of you with an excellent cardiovascular workout, while your dog also develops improved coordination. 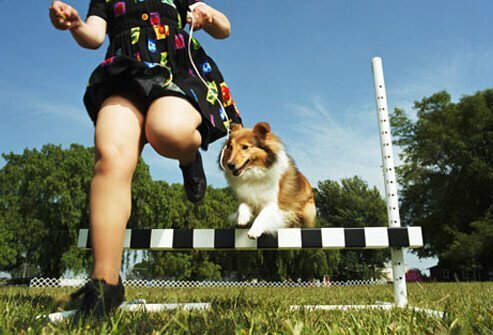 Participate in organized competitions or look for a park with an agility course you can use on your own time. 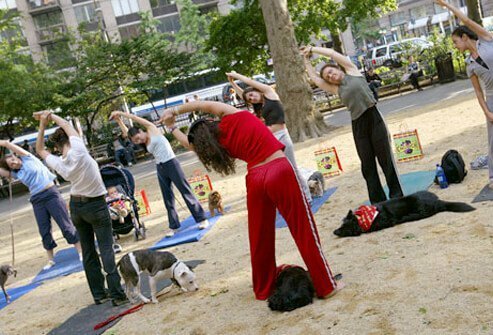 Downward-dog takes on a whole new spin when you bring your dog to yoga class. "Doga" incorporates your pet into Hatha yoga poses. For example, you recline in resting pose with your legs bent over your terrier's torso. Classes are springing up across the country, but this is no fat-burner for Fido. Experts say it's great for the owner-pet bond, but not much of an exercise experience for your dog. If you're a soccer fanatic, why not make your dog a fan, too? 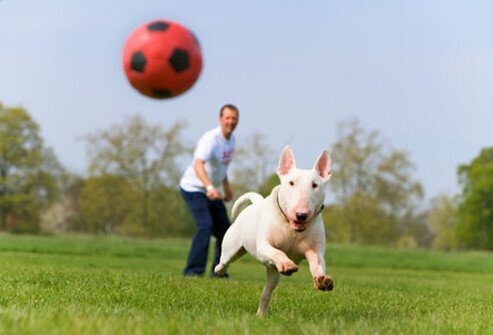 Check your pet supply store for soccer-style exercise balls for dogs. These are made of hard plastic and come in different sizes to suit your particular breed. You kick the ball, and your dog tries to pass it back with his nose or paws. You can also use a regular soccer ball made for people -- just be careful about kicking the ball directly at your dog's face or body. 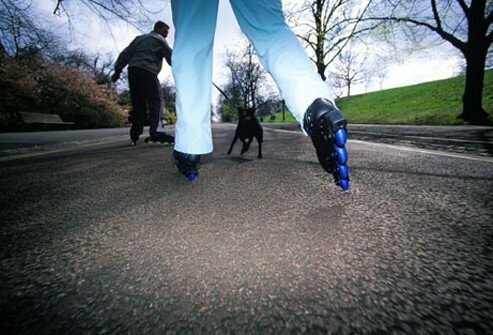 People who like rollerblading may be afraid to bring their pup along. No one wants to be yanked off the sidewalk whenever Sparky spots a squirrel. But experts say rollerblading with your leashed dog can be safe with proper training. The goal is to have your dog run right next to you without pulling on the leash. You may be able to encourage this behavior by giving her treats whenever she runs without yanking you around. Like rollerblading, cycling safely with your dog requires special training. 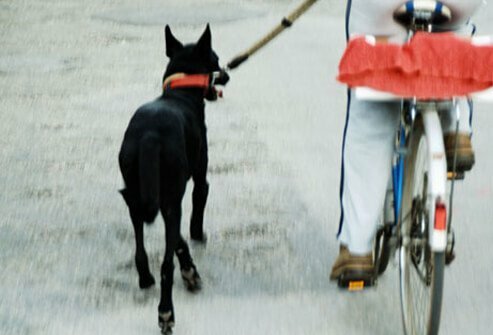 Teach your dog to run next to the bicycle without pulling. You may want to attach her leash to your bike with a Springer. This is a device that absorbs some of the force of your dog's tugs, which could help you keep your balance if she pulls suddenly. Keep a close eye on your dog's condition. It's easy for her to overdo it if she's running while you're on wheels. To provide a chance for off-leash play, find a local dog park. 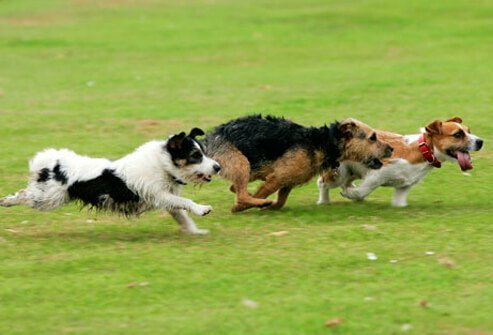 Off-leash running and playing lets your dog set his own pace, so he can burn energy and rest when he's tired. Other perks include the chance to socialize and the mental stimulation that comes with unfettered exploration. Dog owners also get a workout trying to keep up with their pets. It's a good idea to complete some obedience training before allowing your dog off-leash. Cross-country skiing offers a vigorous workout. Just 20 minutes, three days a week, may deliver as many health benefits as walking 30 minutes, five days a week. 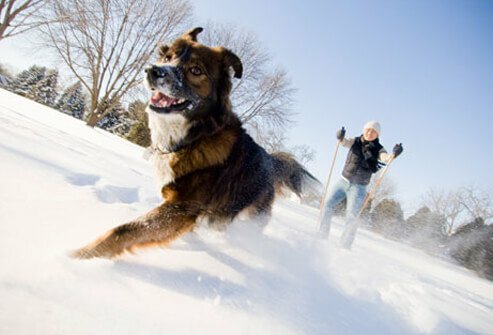 If your dog is athletic and weighs at least 30 pounds, he may qualify as your ski buddy. In skijooring, your dog is harnessed to you while you ski. Beginners should consider an introductory course with skijooring safety tips for man and beast. 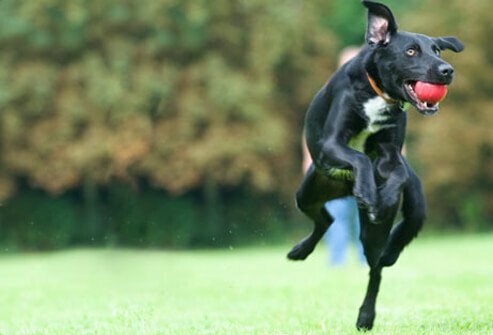 Fetching a ball or favorite toy over and over can be great exercise for your dog. But it doesn't do much for you, if you're just standing there tossing. Instead, make a game of fetch part of your home workout routine. Do lunges or abdominal crunches as you throw the ball. You might build more muscle by throwing a heavy ball, but a soft, lightweight toy is safest for your dog's mouth. When making your dog your exercise buddy, step one is a trip to the vet. 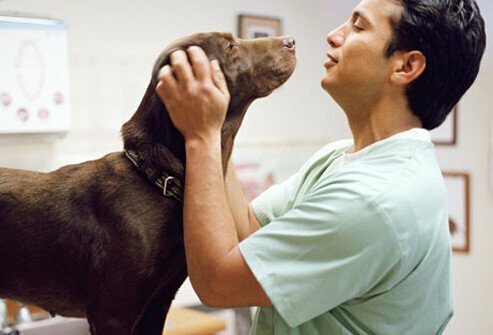 Your vet can evaluate your dog for any heart, lung, or other health problems. It’s also important to check for signs of arthritis or musculoskeletal disease. A dog with inflamed joints or ligaments may require a low-impact exercise plan. Develop a workout routine that's realistic, considering your job schedule and other demands on your time. Also consider your dog's needs – working breeds and juvenile dogs usually need a lot of exercise. Start with a short-term goal of exercising just five or 10 minutes every day. Gradually work up to 30 minutes on most days of the week. Keep in mind that deep-chested breeds, such as Danes or Doberman pinschers, should not exercise right after meals. When exercising with your dog, watch for signs that one of you may be overdoing it. You may be working too hard if you are too breathless to carry on a conversation. Your dog may be overworked if he is breathing fast, panting excessively, staggering, or refusing to follow you. If either of you are stiff, sore, or exhausted for hours after a workout, take it easier next time. 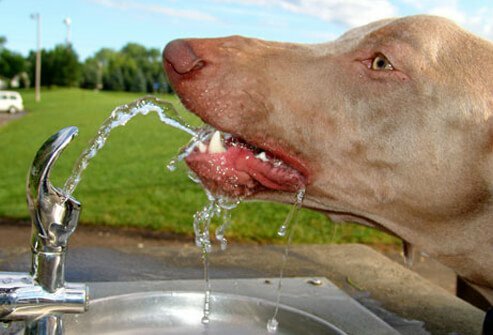 Just like people, dogs are susceptible to dehydration and heat exhaustion. On hot days, bring a water bottle and foldable drinking bowl or stick to places with a public water source. 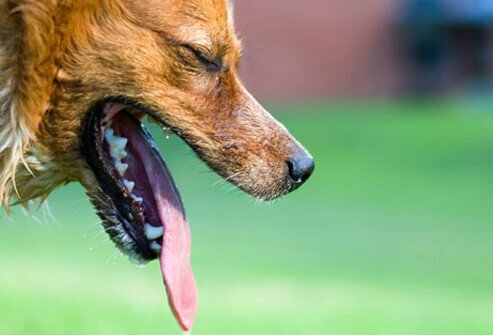 Signs of dehydration in dogs include excessive panting, confusion, weakness, and collapse. Brachycephalic or short-faced breeds, such as bulldogs and boxers, are especially vulnerable because they don't pant efficiently. Long walks on rough surfaces can damage a dog's paws. Start slowly. If you work your way up to longer walks, most dogs will develop thicker pads on their feet and not have problems. On hot days, avoid too much contact with asphalt or sand. On snowy days, check paws for ice build-up. And if you venture onto very rough surfaces, consider buying a set of dog booties. Just because your senior dog moves with a slower, stiffer gait than when he was a pup doesn't mean he should stop exercising. Senior dogs, especially those with arthritis, not only can exercise -- in many cases, they should. Exercise helps increase flexibility and endurance, strengthens muscles around the joints, and can help stave off health problems caused by obesity. Exercise also aids bowel function, which is especially important in older dogs. And, since obesity tends to make arthritis worse, any activity that helps your dog lose weight could ease his symptoms in the long run. Try low-impact exercises, such as swimming and moderate walking, with your old fellow. American Kennel Club: "Summer Safety Tips." 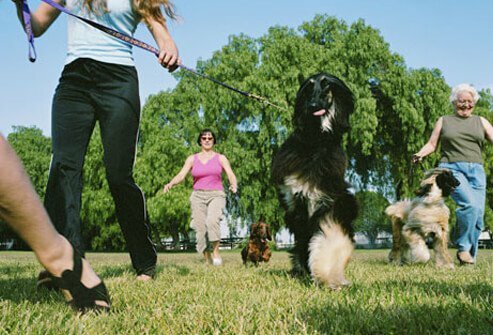 American Society for the Prevention of Cruelty to Animals: "Exercise for Dogs." American Veterinary Medical Association: "Advising Clients About Dog Parks." Association for Pet Obesity Prevention. British Columbia Society for the Prevention of Cruelty to Animals: "Exercising with Your Dog." Dogchannel.com: "Exercise and Diet for Weight Loss" and "Team Up for Dog Weight Loss." ExerciseMyDog.com: "Exercising and Dogs with Arthritis." Kushner, R. Obesity, October 2006. Midwest Skijorers Club: "Types of Skijoring." Katherine Scott, DVM, internal medicine and emergency/critical care, Texas A&M University College of Veterinary Medicine. University of Illinois at Urbana-Champaign, College of Veterinary Medicine: "Brain Exercise Keeps Older Dogs Sharp."